There has been a common thread on early education forums recently about how best to share information with parents. Parents are the child’s first educators and most good early education settings will look for ways to share learning journeys with parents. There could be barriers; some busy parents want to rush away without spending time conversing, other families are hard to reach, English is not their first language or they may feel uncomfortable about talking to teachers but it is important to understand a child’s home background and to support learning at home. Put yourself for one moment in the shoes of a parent who drops their child to your setting at the start of the day and won’t see them again until it is almost bedtime. Imagine you are a parent who has stayed at home with your child for 5 years to suddenly find them in full-time school. Most young children will find it hard to remember what they have done during the day, leaving parents feeling completely out of touch with their child’s world. I remember when my daughter started school for the first time and feeling sad because I was no longer in control of her influences. Thanks to the thorough keyworkers and pre-school staff we knew everything that went on every day. As a parent there are a few simple things that can help. Start by asking very specific questions – Did you like the story you read today? What was your favourite thing that happened today? Who did you play with at playtime? Chat to the other parents in the playground, children usually tell different stories and you may start to piece things together. As teachers there are things we can do to help. When parents feel valued and a part of their child’s learning and fully informed about what, why and how their children are learning, it is less likely that there will be a feeling of them and us. All the children did some nice singing and organised themselves carefully. They did really well at remembering what the characters in the play said. Some of them wanted to sit on chairs and be the audience. This describes perfectly the warmth that emanates from the documentation in Reggio Emilia – it is like shouting from the rooftops – look at what our children are doing. Isn’t it fascinating? Come and join in. Many good examples of documentation of children’s learning can be found in the projects of Sightlines Initiative. The pictures tell the story of the child’s fascinations and the teacher annotates explaining the learning that took place. The Wow moment was added by a parent about learning that had occurred at home. 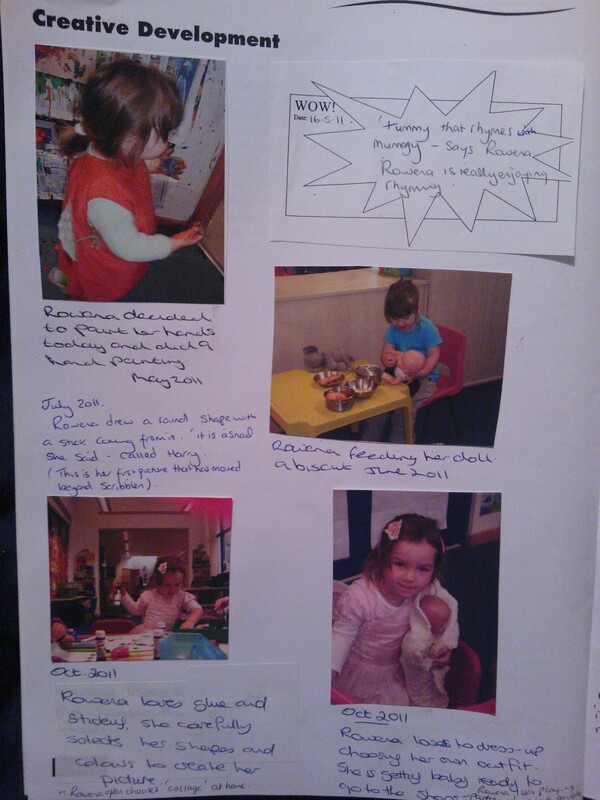 Parents can also comment on the learning at pre-school to show how this matches with what they do at home. Learning diaries have been available for every Foundation Stage child (up until the end of their first year at school) in the UK since 2008. 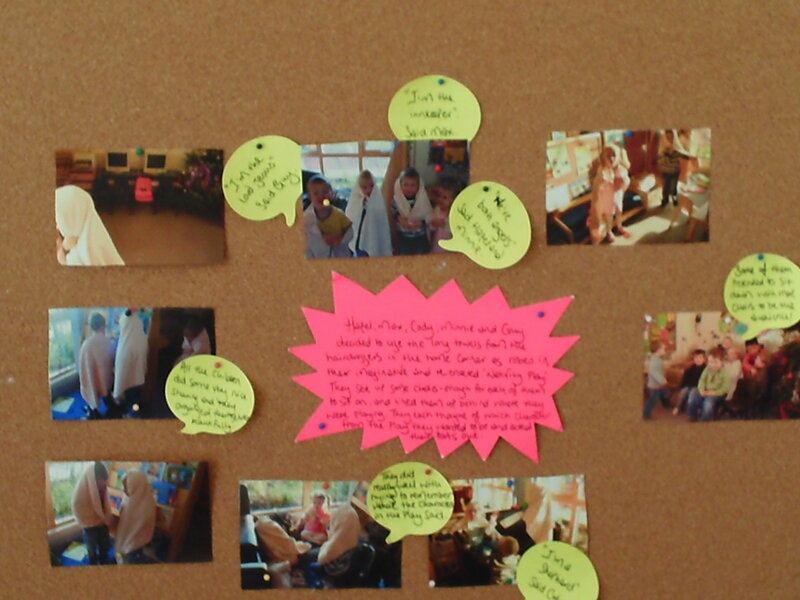 These show the learning journeys of individual children through photographs, children’s comments and teacher analysis of learning. The diaries are an excellent record of progress and should move with the children when they go to school. Parents should be made aware that they are available to be viewed at all times and encouraged to comment about learning at home. An example of a learning diary extract for a child under 2. Learning diaries work best when they are, as the title suggests, a record of children’s learning. My first encounter with learning diaries was when working with children with additional needs, as a way of understanding what was happening at home and how that translated into their behaviour at school. In my experience this shared aspect of the diary is sometimes missed. Emphasise that this is the child’s book and it is important that everyone involved with the child shares information to build up a complete picture of the child. If parents are struggling to get information from their children about the day at school it can be useful to display a timetable. Some specific information is also helpful, such as today we read this story or we looked at seeds and berries. Not all will agree but I think that modern technology could revolutionise the way we build partnerships with parents. Allowing parents access to your email (preferably not your personal one) is a great way of sharing experience though I would suggest creating guidelines. Perhaps suggest that the email is for sending anecdotes about events or things they have been doing at home that they may like to share or build on in class. Teachers could send photographs to parents during the day of their children’s learning or maybe create an online version of the learning diary? I once had a childminder who even in the days before smartphones sent my daughter home with a sheet of thumbnail photos depicting what she had been doing that day. This meant so much and gave me a great starting point for talking about her day. In my experience most pre-schools and schools profess to have an open-door policy but in reality it means little. Many encourage parents to help at school and this is a great way of understanding what children are doing at school. However for working parents and those with younger siblings this is not always an option. Most nurseries and pre-schools invite parents in to the classroom to collect their child. Parents have the chance to familiarise themselves with the environment, children can show their parents what they have been doing and there is a chance to talk to the staff. It surprised me when my daughter started at a school based nursery that children were handed to parents at the door and we weren’t invited in. It can help parents to feel a part of their child’s day if the room remains set up at the end of the day and they are able to wander around with their child talking about what they have learned. Clearly this can be difficult if younger siblings start to play with toys or children don’t want to leave, so simply leaving one or 2 things out is sufficient. Outlining rules about this being a talking/sharing time not a play time should also help along with setting a clear time for leaving. Not all children/parents will want to stay every day. Perhaps encourage a parents’ rota for helping clear away. Parents will not continually demand information from you about their children as they will feel better informed. Parents will be less anxious about their children if they feel a part of their life at school/nursery. The children will be more likely to share what they have done with their parents by proudly showing their documentation and learning diaries. 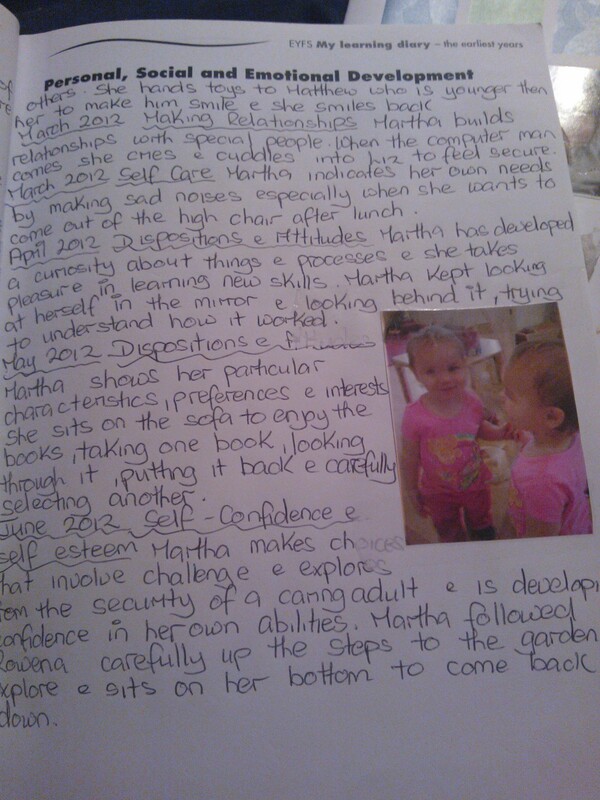 Children can encourage parents to contribute to learning diaries creating a clear picture of the child for the teacher. Photographs are a wonderful way of sharing information with families for whom English is not their first language. Parents will feel better equipped to support their child’s learning at home. With thanks to North Somerset Early Years advisory team, Liz Maggs, Hilltop Pre-School and Early Birds Nursery – Long Ashton for images and learning diary extracts. Previous PostFed Up With the Same Old Books for Your Kids? Try Something Different From Quirk Books.Next PostActivities to Build Children’s Language Development from Ages 3-5. Really valuable post – even with pre-schoolers am discovering it’s very valuable to proactively keep a simple diary of things at home and school. Can be very useful in unravelling any problems that emerge. We send a weekly newsletter home on a Friday. It lists some of the things that will be going on in the next week to give families a starting point for conversations. Some families send in relevant objects, photos or information. Thanks for sharing. It’s great that you give your parents so much information. I would also add that by documenting learning we show what they have been doing and where we will go next. It also means that we can have flexibility in our classrooms. Parents will begin to understand that learning does not have to be mapped out a term in advance but can be drawn from the children’s fascinations and interests.